The first circus train left New Jersey in 1872. It was organized by showman William Cameron Coup, who had partnered with the Barnum circus and the Dan Castello circus for a show that would prove revolutionary. Travelling by train dramatically changed the circus, which had before then traveled overland, with hundreds of horses pulling wagons. Now, circuses could travel the continent, with animals, sideshow entertainers, curiosities, and performers, all in significantly less time. The circus trains consisted of many specialized cars. The core of the circus was the flatcar, which facilitated the movement of circus wagons. Instead of having to jam animals and supplies into a conventional boxcar, the flatcars allowed wagons to load the train from the front to the end. Horses, camels, and the star-attraction, elephants, travelled in stockcars, while the performers travelled in coaches. Ringling Brothers and Barnum and Bailey were the major users of circus trains, owning their own trains. 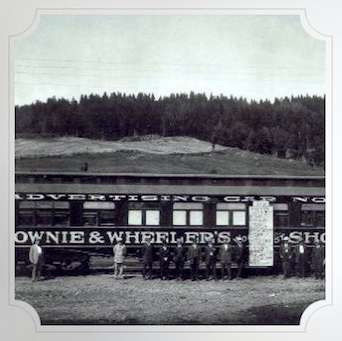 The first circus owned train was made up of 60 cars and was over 1.6 km. in length. Circus trains also ran ‘advance cars’ that arrived weeks ahead of the circus, and plastered available surfaces with posters. These were simple cars – Pullman berths for people to sleep in, tables for preparing the posters, cabinets for storing the posters, and an upright boiler used to make flour paste for gluing on the posters. The paste-maker usually doubled as the cook.